On the second round of muscle-ups, she started to feel it. Something wasn’t right. She continued, moving on to 10 165-lb. deadlifts, 15 GHD sit-ups and then the 100-yard sprint. But in the first third of the run, Becca Voigt fell on all fours. “We need a medic!” the emcee yelled into the microphone as spectators stared. And she did. Voigt finished the second day’s first workout with a time of 10:50, tying Gretchen Kittelberger for 15th. Nine days before the Games, Voigt had been in a car accident. “I freaked out when it happened because I was scared I wasn’t going to be able to compete,” Voigt remembered. But she did. And she didn’t just compete; she finished third overall. And she didn’t just finish third; she took a podium spot while battling two forms of vertigo. I'm glad to see they have a good Chiropractor on hand at the Games. As a Chiropractor myself, I see cases of vertigo drastically improve all the time. I would give my right arm (figuratively speaking) to work with athletes at the Games. Inspiring story! Thanks to Andréa for writing it and thanks to Becca for giving us a glimpse of your struggle against an invisible enemy. While I can't relate to the feeling of being one of the best athletes in the world, I can certainly understand some of the challenges you describe. Just over a year ago my training for a local masters CF competition was interrupted when I suffered from an attack of idiopathic sudden deafness syndrome which pretty much wiped out the hearing and balance functions from my right ear. The vertigo and nausea were so bad during the first several days that I was eventually admitted to the hospital to rehydrate via IV because I couldn't keep anything down. My wife said that she knew I really wasn't faking it when I couldn't help puking while being examined by a particularly beautiful young doctor. Learning the Epley sequence helped make things manageable initially and I got back to work within a week, but my equilibrium was off like I had a several beer buzz going for a long time afterwards. It was nearly a month before I felt steady enough to drive a car or ride a bike, but I was back to doing pullups within the first few days because it felt more secure to be hanging than to be standing. My hearing and balance nerves on that side are not coming back but with the right help and hearing aids I'm learning to deal with it. Upright stuff like skiing, most cycling, skateboarding and such still works but inverted balance stuff and transitions in head position still make me a bit unsteady. I'll be judging this year's CF competition rather than competing, and that's just fine. 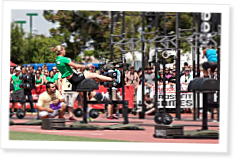 It was an honor and privilege working with Rebecca at this years Crossfit Games. She is truly a champion! Right on, girl! I was thrilled to see you on that podium at the Games. It's so obvious you are extraordinary both mentally and physically, but it's really inspiring to see how you handled this and just kept going. Wow. Best to you in your training for next year! I was already a Becca fan, but after I heard her story at the Games it took my admiration of her to another level. She must be one of the mentally toughest competitors I've seen compete. I am a MAJOR fan of all of the podium finishers this year (and all of the competitors for that matter)....but for me, Becca is the most inspirational athlete of the 2011 Games. Not just because of the vertigo, but because I know how hard she works and how strong a person she is to have made it happen for herself this year. Wow, doing CrossFit is hard enough. I can't imagine doing what Becca did with dizziness and nausea BEFORE the WOD. Amazing mental toughness!! Just a word to the readers, the condition Becca suffered from, medically termed "Benign Positional Vertigo" may not be life threatening, but it's absolutely miserable for sufferers. I would like to clarify that the Epley maneuver, although simple, is effective more than 80% of the time. For anyone with this condition (usually from head trauma or whip lash), the Epley maneuver is very unlikely to make things worse as the article stated, and is almost always worth trying for vertigo sufferers. We learn the Epley maneuver in medical school, but you can learn to do it yourself from YouTube.